Forget the Tables for Your Company Picnic. Go With Custom Blankets! The thing about company picnics is that oftentimes you get a bit of a production line with it. And then it feels a little too much like, well, work. Yes, we understand: you need a place to put all the food on. But you certainly don’t need to sit at one of those tables either! Company picnics are all about freedom. Fun. Fellowship. Taking the business out of the company and remembering that you’re all a team, and you can enjoy company and remind each other than it’s not just about making money. It’s about making a difference. It’s obvious that a business wants from time to time to set up functions and bolster employee morale. Why not do it the best way possible and utilize blankets for those participating in picnics and celebrate your business that way? Don’t have your employees simply bring their own stuff. Provide for everyone. Makes everyone feel pride about who they work for, and the picnic isn’t just an opportunity to get a free meal. It’s to remind everyone that your business is a great place to work. Further marketing and advertising makes for great times in reputation management. 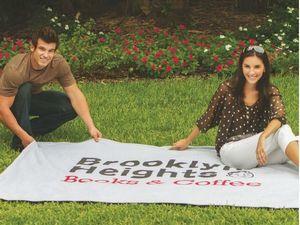 Your employees are enjoying themselves on your custom blankets! Take photos and videos. Post them on your social media. Let your entire industry know that you’re not just a leader in the business. You’re a leader for the entire corporate world of the economy. But custom blankets can go a long way in imprinting a lasting memory in an employee’s mind. You want great recognition, and it steadily grows in following years, and it never dies. That’s how you build a lasting legacy. With small things. And they lead to bigger possibilities. Just know that’s not the only way to use custom blankets. You can click here to find more options. And check out our various printed brands as well. Want more info? Contact us today for details. And thanks for reading, from BRAVA Marketing.